Owned by Gary Stewart and his wife Sue, Revolution has been around in its current incarnation since 1996. The club is open Friday and Saturday and shares a 10,000 square foot building with Flying Dog Restaurant, an upscale casual dining emporium that offers DJ-driven entertainment on weekends. Asked about the club’s longevity, Stewart answers, “We’re fortunate to have three universities that provide is with a new group of customers every September, not to mention all those tech companies. 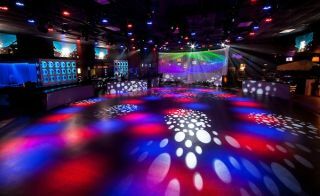 In addition to the LED panels, Revolution’s new lighting system consists of an Arkaos Media Master stage server; 24 Elation Design Spot pro 250s; six Martin Professional Atomic 3000DMX strobes; two Titan RBG 6 watt lasers, 60 Microh LED RGBW Max Zoom quad wash lights; a Livid OHM 64 MIDI controller; two Martin Professional/Jem K1 hazers and a 23-inch LCD touch screen monitor. Revolution’s current audio upgrade features a new Martin Audio speaker system consisting of eight Blackline H3H+ three-way Hybrid system enclosures, ten WSX subwoofers, DX2 speaker processing and MA5.2K and MA9.6K power amplifiers. This powerful new setup replaces an older Martin Audio system at a cost of just under $200,000.